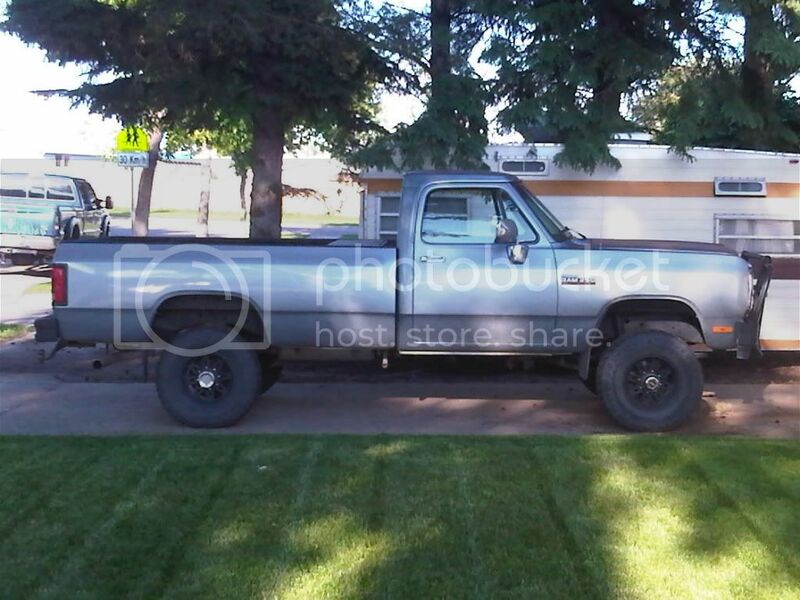 So.....fixing to ditch the extra overloads in the rear of the dodge,to get the ride back to where it was factory. Since I don't run off to bf Egypt after stuff anymore and stay local-ish I don't figure I need them any longer. If by some chance I do,and need some more weight capacity.....I think the bags will be the hot ticket. Now,before I get to figuring the how to do, I have a question...... A long time ago,it was mentioned in a few post.....about "ping" tanks in line with the bags to make the ride smoother while still retaining the weight capacity. Is this worth doing? Are you doing a full air suspension or just add on bags? If I still had my 91 I would try adding the tanks and let you know. In theory it should cushion the ride some. I found the bags made the ride harsher with just the bags installed. I removed the bags frequently when I didn't need them. Philip wrote: Are you doing a full air suspension or just add on bags? BILTIT wrote: If I still had my 91 I would try adding the tanks and let you know. In theory it should cushion the ride some. Why remove them? I would think you could have just let the air out and motor on. Add on bags require you to keep at least 5 PSI in them at all times. I know a person that tried to keep 0 in them. After about a year one bag had a hole in it. The bags would buckle and rub when empty on suspension movement. I don't think a ping tank would be needed. Those bags at 5 PSI didn't change the ride one bit on my friends truck. He had them installed on a 1/2 ton ford. Ya i ran them with 5psi or less but they do change the ride. The change isnt so much from the amount of air in the bag but the way they bolt on to the spring. They clamp onto the leaf spring, reducing its capability to move and this results in a stiffer ride. The newer trucks went away from this design and the bags bolt onto the axle tube instead of the spring itself. Our springs are rather short to begin with and this is what gives our 1st gens the stiffer ride from factory. All other trucks (from 88 to new) went to longer rear springs to effectively reduce stiffness. I knew you had to keep some in them,I've used enough air shocks to know what happens when there's nothing in them. The go south quickly. I might just go ahead and put them on.....add the tank later on if need be. It's not like there's not tons of room under the bed. I've looked at the manual valves for airing up and deflating the bags in cab. Figure to use the train horn air compressor/tank for a source. Any recommendations as to a brand of valve? I had them on mine to make up for whipped springs, they were harsh carrying the weight of the truck. I had 40psi in them to keep it level, it held it up about 3 inches. I thought about putting them back in and just setting them at 5 psi or so in case I need them. I also had a leveling valve from a big rig to keep the truck level no matter the load. I haven't decided yet, as I put a hitch in the 97 and used that the last few times I hauled the trailer. PToombs wrote: I had them on mine to make up for whipped springs, they were harsh carrying the weight of the truck. I had 40psi in them to keep it level, it held it up about 3 inches. I thought about putting them back in and just setting them at 5 psi or so in case I need them. I also had a leveling valve from a big rig to keep the truck level no matter the load. I haven't decided yet, as I put a hitch in the 97 and used that the last few times I hauled the trailer. Think the tank would help Pete? I just picked up a set of airbag overlaods as well. 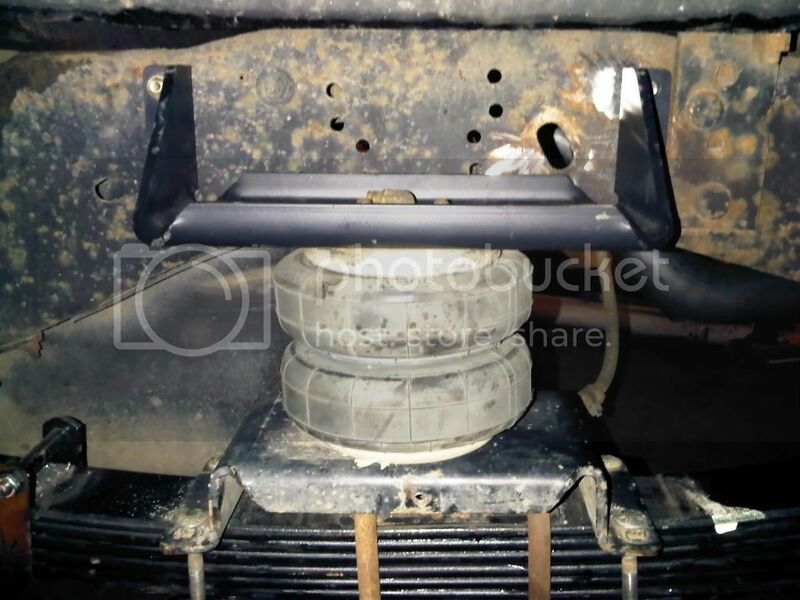 Was looking at the instruction on installing them, and they show one picture with the lower air bag bracket mounted to the stock over load spring. Not sure if that single spring would take the load of a bag pumped up to 40 psi? But i too have come across mention of a main air reservoir tank making the ride when empty a bit smoother. ellis93 wrote: I knew you had to keep some in them,I've used enough air shocks to know what happens when there's nothing in them. The go south quickly. I am running this kit on my 03 and it works really well. I realize you don't need the compressor etc. but it is a sweet setup. I was running the ride rite (air-rite) single setup on my 91 and it worked well too but took a little more space. I would never run bags again that are tee'd together, get the dual control or some check valves. It might have Ellis. I had the line from the leveling valve Teed to each bag with a gauge port in it so I could watch pressure. There was no place extra to allow give. 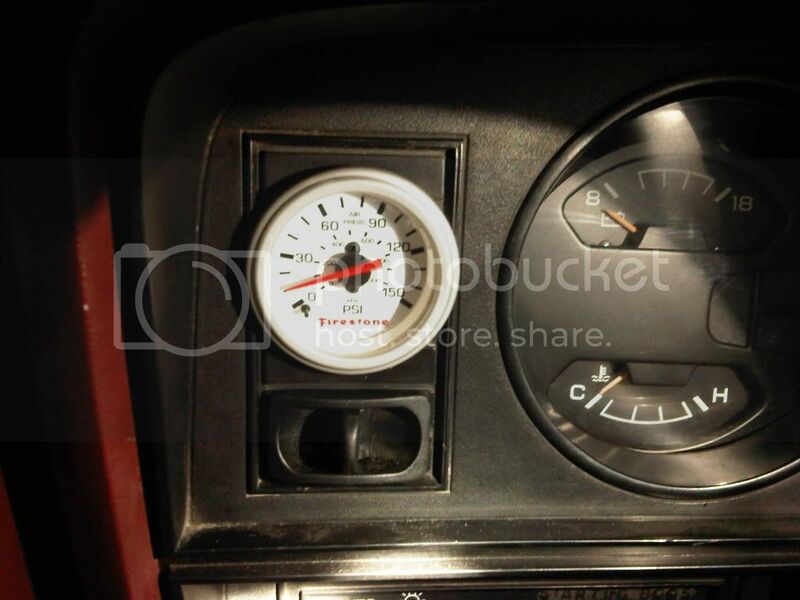 If I hit a bump I could see the gauge jump, so I think they would have helped a lot in my situation. Cows, On my set up the bag mounted directly over the center of the axle, and there is a spacer block there so it shouldn't be a problem with the weight. The scary thing was the time I put about 3 face cord of firewood on, and the truck was sagging. The compressor was off so I turned it on. When the bag pressure got to 120 psi I decided I better turn it off again! It was a slow and careful ride home. Ever get this on Ellis? and did you run ping tanks?? My cousin just gave me a set of like new bags that I'm going to throw on once I put a different rearend and springs under my truck. Also I'm just planning on running the lines out the back and airing each individual bag up separately. I figure if its Tee'd to the other bag when it gets weight on one side it will just force air to the other bag and not ride right unless there is a check valve in the bag itself.